Kelly Blue Book named the 2018 Subaru Impreza to the 10 Coolest Cars Under $20K list. There are three reasons why it will have millennials looking. 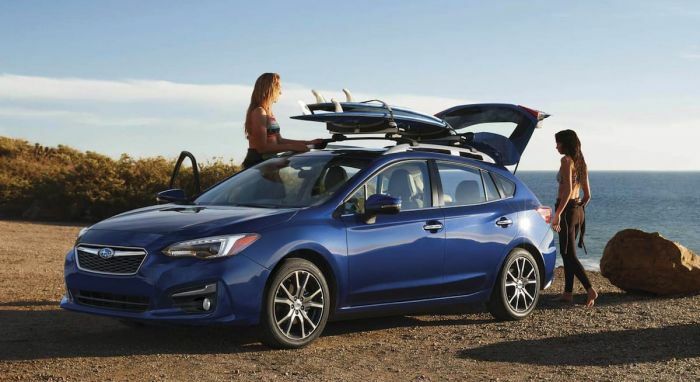 When it comes to being cool, Kelly Blue Book says the 2018 Subaru Impreza is one of the 10 Coolest New Cars Under $20,000 in America for three reasons; capability, styling, and value. It’s a compact car millennials are drawn to for it’s all-wheel-drive all-weather capability, technology and convenience features like smartphone integration with Apple CarPlay and Android Auto, and comes in sedan and 5-door hatch body styles. Impreza comes standard with Subaru’s Symmetrical all-wheel-drive and it’s what set the brand apart starting in the 1970s. The compact car has a “go-anywhere” attitude with all-weather capability in every climate. You don’t have to push buttons or turn knobs to get the AWD traction. It comes with a full time all-wheel-drive system sending power to the wheels with the best traction so the car stays on course. The 2018 Impreza achieves the highest fuel economy of any gasoline all-wheel drive car available in America. EPA estimated ratings of up to 28/38 city/highway mpg and 32 combined mpg with the CVT automatic transmission are comparable with front-wheel drive cars. Vincentric recently gave Impreza Best Fleet Value In America award for having the lowest ownership costs. Inside, the Impreza compact comes with the most passenger volume in its class. The 2018 Impreza 2.0i sedan comes with 99.8 cubic feet of passenger volume Impreza 2.0i 5-Door has 100.9 cu.ft, where the 2018 Honda Civic sedan has 97.8 cu.ft, (97.0 Civic Hatch), the 2018 Mazda3 sedan has 96.3 cu.ft (96.4 Mazda3 5-Door), and the 2018 Ford Focus sedan has 9.0 cu.ft. (90.0 Ford Focus Hatch). The 2018 Subaru Impreza 2.0i sedan starts at $18,495, the 2.0i 5-Door starts at $18,995 and comes standard with all-wheel-drive, Subaru’s STARLINK Multimedia with Apple CarPlay and Android Auto, a rear-vision camera, and Vehicle Dynamics Control. It also features power windows with auto-up/down on both driver and passenger sides, 60/40-split fold-down rear seat, power door locks and side mirrors, multi-function display with fuel economy information, tilt and telescoping steering column, and security system with engine immobilizer. The 2018 Subaru Impreza sedan and 5-Door hatchback were named to Kelley Blue Book’s 10 Coolest New Cars Under $20,000 for 2018 for capability, styling and value. The other cars on the KBB coolest list are the Mazda3, Honda Civic, Hyundai Kona, Volkswagen Golf, Kia Soul, Jeep Renegade, Honda Fit, Hyundai Elantra and Chevrolet Sonic.